Candy, flowers and greeting cards are some of the traditional items associated with Valentine’s Day. If we receive flowers, they would probably be put in a vase and used as a centerpiece. If we don’t want to wait until Valentine’s Day … could go to our gardens and cut flowers … buy flowers at a florist or even the grocery store … or … make something fun sweet easy funky and a little quirky. 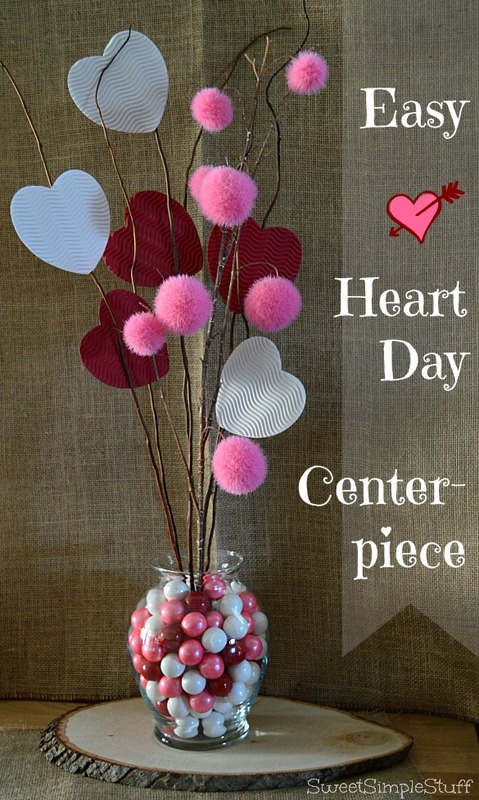 Get you glue gun out … make an Easy Heart Day Centerpiece! Sometimes I feel a little crafty, especially when I’m shopping at Michael’s, JoAnn’s, Hobby Lobby or the Dollar Tree! I see stuff and want to make everything … may take a while, but eventually I come back to reality … can’t do it all! I’m not a flower arranger … this is what I can do … easy, quick and quirky. The project was pretty cheap … thanks to sales and 40% off coupons! The pink pom-poms are part of the spring line (other colors are available) and caught my eye immediately. They spoke to me … can you relate? I grabbed it and everything else fell into place. 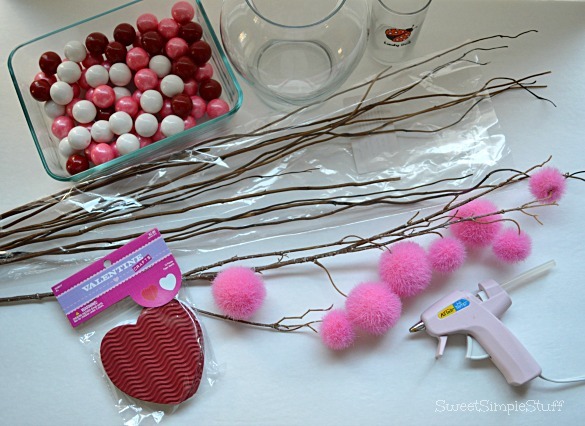 The pom-poms may get reused for Easter and about half of the package of sticks is leftover. 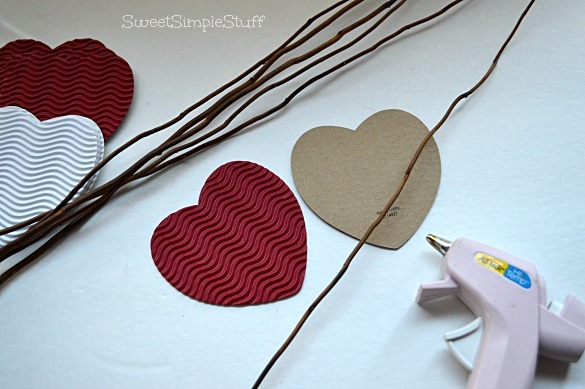 Use just a few dots of glue to attach two hearts (wrong side to wrong side) around each stick (total of 6 sticks). 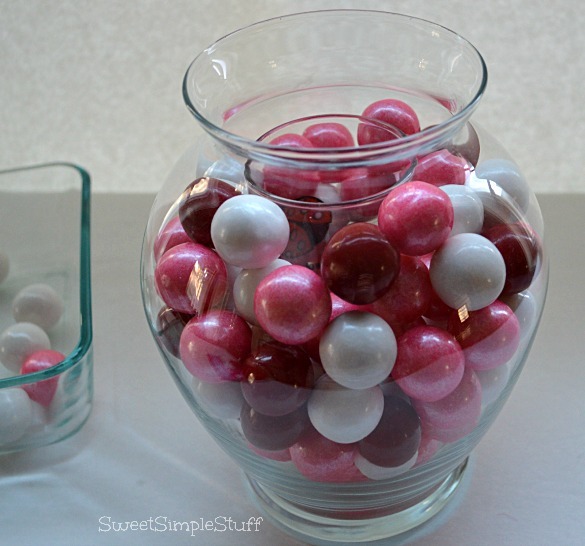 Put the smaller glass in the vase and fill with gumballs. I tried using the juice glass, but it was too large and didn’t allow me to put enough gumballs in. A paper towel tube/roll worked better … trial and error! 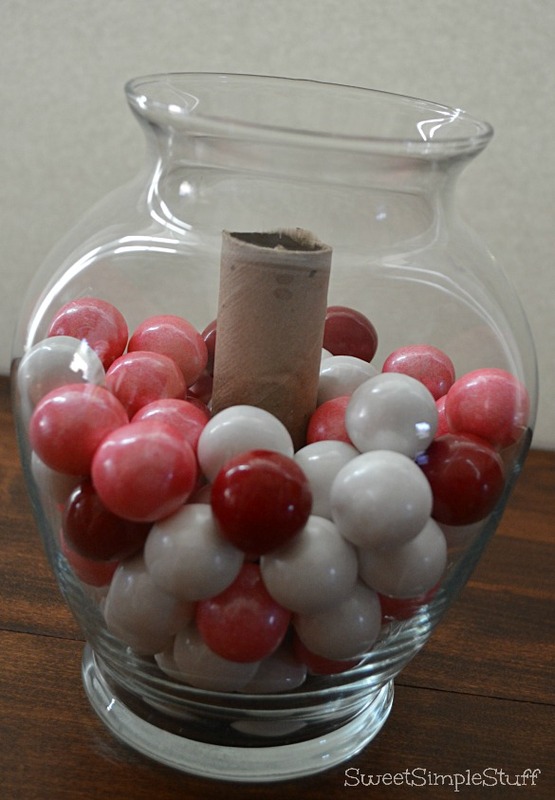 Note: I didn’t want the gumballs to come in contact with the sticks, just to ensure that they would be safe for consumption. If you don’t have this same concern, you could skip this step). 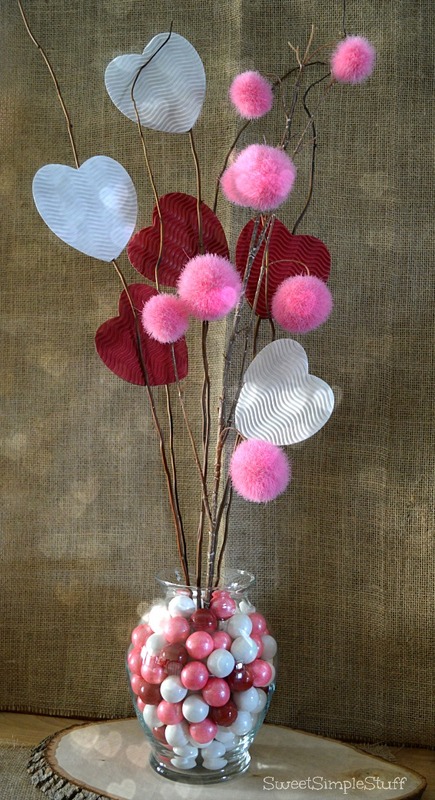 Arrange your pom-poms and hearts in the inner tube/roll of the vase. The pom-poms are on a vinyl covered wire and a cutter will be needed to trim the length, but the sticks can be broken off quite easily. I confess … the pom-poms got me and I loved all of the colors, but I controlled myself and only bought the pink ones … figuring that they would get used for Easter, too. Are you a crafter and where do buy your supplies? Now for a little romantic feel, add some votive candles on each side of your center piece, scatter some red and/or pink faux rose petals, put on some nice soft romantic music and you and your hubby can have a wonderful, romantic evening. Oh, like your flamingo as well. I have a metal one that holds a potted plant sitting out in my front yard underneath our Martin house. Thank you Colleen 🙂 We have a flamingo connection … mine are getting pretty old … even got a little sunburn!